The pups that star in it are, after all, idealized versions of their preschool viewers, just like “Mary Sue” characters are for adults. In this case, they are small and spunky but ultra-capable creatures, loaded up with cool toys and ready to laugh way too long at a simple pun. The pups do everything a preschooler wants to do. They rescue dinosaur babies, they wrangle mischievous kittens, they transform into a Sea Patrol to save a wiggling whale. As the seasons have progressed, the pups get more and more fun stuff to use. Suped-up backpacks (with tools like wings, baseball launchers, or water canons) are old hat by season ten. Now they also have a mission cruiser bus filled with personalized motorcycles and a Robo-dog. As an added bonus for kids, unlike so many of their shows, it is free of virtually any educational value. There’s nary a number or a letter to be seen in this utopia of Adventure Island, just bumbling adults always in need of canine assistance. When the pups inevitably solve the problem with ease, they are much celebrated for their non-academic achievements. Don’t get me wrong – I don’t think there’s much wrong a show that’s just fun. For that matter, I think it’s ok to have a Mary Sue of any gender or species. Adults have been salivating over superficial superheroes forever. Why not let the younger set have their own wish fulfillment? That said, “Paw Patrol” can be a smidge problematic in other ways. For instance, it’s strangely free of the modern era’s take on gender equality – with the only female pup being the aforementioned pink-clad Skye. Sure, she’s feisty and can fly and is occasionally joined by fellow female Everest, who branches out to wearing a light purple. Still, it’s a fairly dismal showing for girls. On top of that, there’s not one but TWO white boys who are the caretakers for the pups, which seems like a missed opportunity – bizarrely missed for a show which started in 2013. Really, would it have been so hard to throw a bone to the girl viewers out there (ha)? Regardless, Paw Patrol’s fans will defend it to the last – or at least until naptime. For little kids who feel powerless in a big, complex world, the show’s got to make them feel great. You can use your strengths to make a difference, be appreciated, and yes, save the day. And as far as messages go, that’s one we need our kids to hear now more than ever. Maybe there’s something to learn from Paw Patrol for all of us. Fortunately, those parents out there desperate to satiate the enormous doggie demand can do so without cable. Full episodes of Paw Patrol are shown on both Nick Jr. and Nickelodeon channel. If you just need a few episodes, there are some available for free on Nick and the Nick Jr. apps which are available on most streaming devices. However, to unlock all episodes you’ll need a password to a cable provider or to a streaming service that offers Nickelodeon. The cheapest option is Philo, which gives you both Nickelodeon and Nick Jr. for $16/month along with 39 other channels. They offer a 1-week free trial for you to try the service. You can then stream Paw Patrol through the Philo app or use your Philo username and password to unlock episodes of Paw Patrol in the Nick app. Check out our review of Philo for more information on the service. Nick Jr. is also offered to stream on Sling TV’s Blue package for $25/month, along with about 40 other channels. You can read all you need to know about that service in our review of Sling TV. Both Nick Jr. and Nickelodeon are offered on DirecTV Now for $40/month, along with about 60 other channels. Another option for those with an Amazon Prime subscription is to buy “Noggin on Amazon,” which is $7.99/month after a week-long free trial. Noggin is part of Nickelodeon. It includes the first five seasons of “Paw Patrol” as well as other Nick Jr. shows like “Blue’s Clues” and “The Backyardigans.” Check out our guide “How to Watch Nickelodeon Online” for full details on all your Nickelodeon channel streaming options. 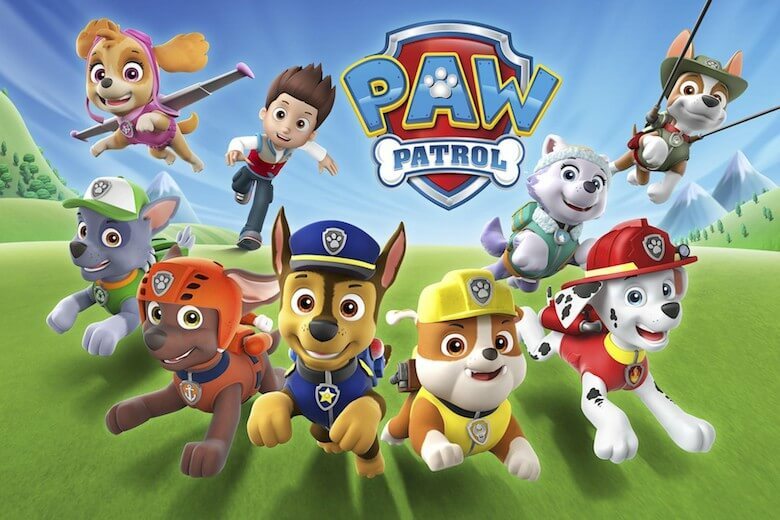 Paw Patrol is not on Netflix or Hulu and Nickelodeon and Nick Jr. are not offered on Hulu Live TV, FuboTV, or PlayStation Vue. Then again, you might be interested only in unfettered, unlimited access to Paw Patrol itself. In that case, you might want to buy episodes or even seasons. On Amazon Prime, Paw Patrol episodes are $2.99 and each season is $29.99. Vudu, Itunes, and YouTube give you an option of SD or HD. Individual episodes are $1.99 for SD and $2.99 for HD. Seasons are between $19.99-$21.99 for SD and $29.99 for HD. Vudu offers a bundle of five episodes for $5.99. Google Play offers episodes for $1.99 and the season for $21.99. It looks like they are in SD, but then again, do you really need super-clear CGIed pups?